1/2 ounce dried porcini mushrooms, soaked in warm water for 30 minutes, then drained and chopped. Heat the olive oil in a 2 quart saucepan; add the garlic and rice and cook until the rice crackles and is well coated in the oil but is not browned. Stir in the wine and allow it to evaporate. Begin adding the broth a ladle at a time allowing the rice to absorb it before adding more. Cook until rice is al dente. Stir in the saffron and Parmigiano Reggiano cheese and add the chopped mushrooms with their liquid. Transfer to a bowl and allow to cool to room temperature. With your hands scoop up about 1/4 cup of rice and make a small indentation in the middle. Place a piece or two of the cheese in the hollow then top with another quarter cup of rice and enclose the cheese and compact it into a ball. Coat the rice balls in breadcrumbs, then coat in the egg whites and then in bread crumbs again. Allow to “dry” on a tray for 10 minutes in the refrigerator. Meanwhile heat 6 cups of the olive oil to 375°F in a deep heavy duty pot or fryer. Fry the rice balls a few at a time until golden brown. Drain on paper towels. Serve with fresh tomato sauce on the side. This recipe is featured on show 2417 - Give Me Rice. This recipe is featured on Season 24 - Episode 2417. "1 ball mozzarella" -- about how many ounces? Sizes vary greatly. Also, would these turn out well if I baked them instead of frying (I could still give them a little crisp for a couple of min in a salute pan if needed)? Would they dry out in the oven? Please let me know what you think and if you have tried this. Thanks! What was the fresh sauce with 12 gloves of garlic and plum tomatoes. Can you use cans? If I were to bake these, I would use a spray bottle, the kind you fill with oil to spray a bottom opf a fry pan, a mist), and spray or mist the rice balls before baking, turn rice balls part way thru baking and spray again. I would buy a good size ball of fresh mozzarella. You can use unused portion sliced with fresh sliced tomato, fresh basil, and hood balsamic vinegar reduction sauce. 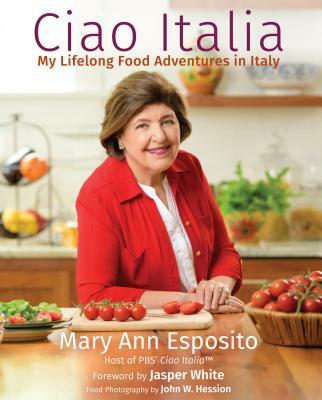 Mary Ann, I have 6 of your cookbooks, and use the Ciao Italia website for additional recipes w/the videos. I cannot find "The Little Rice Balls w/Mushrooms and Mozzarella, Episode 2417" recipe in any of them. Can you tell me if i am missing it somewhere. We are making the recipe for the first time today.....So far, so good. you are just awesome! Hi, Theresa, That recipe is not in any of Mary Ann’s cookbooks, but it’s here on our website for your convenience. Mary Ann I love you and everything you make. I have very few cookbooks but 3 of them are yours and the only ones I use. I'm Italian my family is from Italy and I grew up eating and making everything you make. I'm teaching my granddaughter to cook what I make and she loves it. She's doing great, but she's busy working and always says "nona, could you make bread or homemade pasta." and I love cooking for my family. I love your shows. Thank you so much.